The proportional pressure reducing valve PDMC05S30A is a direct-acting spool-type valve. When there is no energy, it closes the port 2. It also connects the port 1 (consumer) to port 3 (tank). Therefore, when the inlet pressure fluctuates it provides an almost constant outlet pressure – depending on the energization of the coil. When the control current increases, the solenoid coil exerts a force on the control spool. 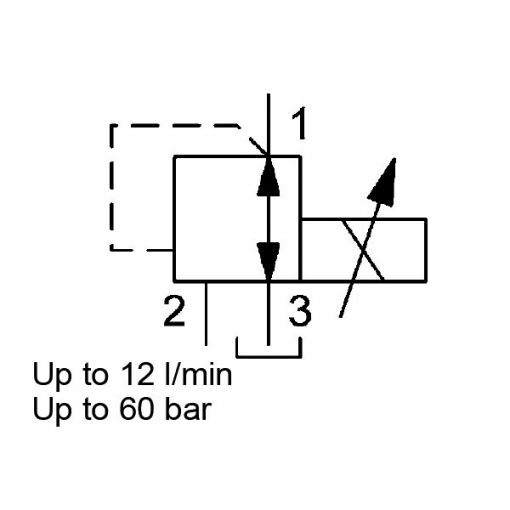 This force is proportional to the control current and thereby, defines the regulated pressure at port 1. This setting is proportional to the control current. Moreover, any pressure at tank port 3 is additive to the pre-set control pressure. If, as a result of external factors, the pressure at port 1 rises above the preset pressure, the valve opens from port 1 to tank port 3.